How does authentic, project-based, multidisciplinary education look in practice? Monday, 10th November: On the first morning Bernard showed us a load of objects from different periods of time on a deer skin. Bernard then made a time line out of the different objects. For example in the beginning of the time line there was a rock that may have been used for a hammer or some type of tool, and in the end of the time line there was a phone bringing us up to the present. Mark Wilson and Bernard showed us the different types of iron you can get and what heat does to the metal, making it more soluble or more brittle, and so on. We then set up our forges and anvils to get ready for our projects. We split into 2 groups, one group making coat hooks and the other making candle holders and candles. The group making hooks only included 3 people. The rest of the class made candle holders. In the hook group Mark showed us the first steps of making the hooks which was doing the curvy bit at the top (the hook itself). We heated up our metal in the charcoal fire, and hammered it into shape. It took a good few tries to try make it how you wanted it to look, and get a sort of technique and rhythm going. Tuesday, 11th November: By the second day every one kind of knew what they were doing now, and progress was really beginning to show. The hook group were working with Bernard, working on the bellows. The bellows took a bit more work than the other forges but still got the job done. In my group we had the hooks done and were happy with the shape of them. Wednesday, 12th November: This was our third and final day with Bernard and Mark Wilson. The first group were finishing their candle holders and making their candles. The rest were making ‘rowkers’, which is half-poker and halfrake so you can pull the coals towards you and push them away. We started with just a round metal bar then we made the handle by bending it around itself, called a rat tail, then we flattened the end and bent it in a certain way. Once that was done we added a few personal designs and oiled it to make it shiny. After that we proudly brought home our very own creations. Project-Based: Students designed and constructed concrete benches and an outdoor table tennis table. So far every Tuesday we have had craft with Mike Keegan. We have been designing and sculpting three concrete benches and an intricate table tennis table. We started off by using clay to create a to-scale model of the table tennis table. All the results were interesting and diverse (if not doable).We did the same for the benches. Then in our pairs we began to construct the cast for the benches. Over time, we crafted the benches very much with Mike’s great help and instructions. We then began to clear and level the designated area for the table tennis table. Mike has very high expectations and hopes for this year’s lessons. Some of these hopes include a full size sand volleyball court and a geodesic dome big enough to stage plays, use as a theatre and be used as an alternative classroom. We have had a lot of good fun in the practical lessons with Mike as he teaches us the ways of concrete. However concrete sculpting is not the only thing we do in Mike’s lessons. We also have a great time listening to Mike’s interesting insights on the problems of the world today. 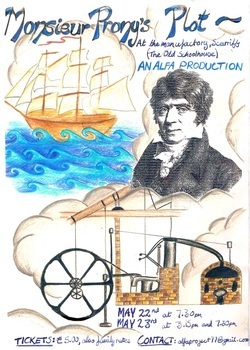 Project-Based: Students read (in French) the history of the steam engine and then planned, wrote, created costumes and sets, and performed a play based on this history. Project-Based: Students applied maths and woodworking to construct their garden's raised beds; botany to learn about basic plant needs and life cycles; enivronmental science to appreciate the recycling of matter through composting; nedchemistry to test the soil; and health and nutrition to decide what to grow. Additionally, the gardens provide a source of inspiration and subject matter for art projects.